The portfolio had a very stable performance despite volatile markets, but currency exchange rates have had a big influence on this. Performance among sectors and stocks has proven to be very mixed. I will stick to my strategy and can't wait for next year's dividend increase announcements! At the beginning of this year, I started the future-proof portfolio for young investors to show how young investors who are saving for their retirement can choose to distribute their funds. A focus on the long-term, no trading and stable investments are three cornerstones of my approach. Let us take a look at how the past period went for the portfolio! Since the last update on August 30, most global markets have experienced corrections. Though the US market experienced a minor decrease, most Asian and European markets are down 10% or more from their yearly highs. How has this affected my portfolio? Let us take a look. The first thing which strikes our eye is that the total result (+6.21%) is almost the same as during the last update at the end of August (+6.25%). With the market declines happening all around the world, my portfolio proved to be quite resilient on aggregate. It should be noted though that a big part of this gain can be attributed to the EUR/USD exchange rate, which went from 1.24 at the start of this investment adventure to 1.14 now. Since a big part of my portfolio is invested in shares which are denominated in US dollar, my gain in euro is much higher than my gain would be if I would be situated in the USA. How did the new positions perform? On the 30th of August, I purchased stocks of Singtel and doubled my position in Tencent. I did this to further diversify my portfolio with Asian companies and to also diversify to a sector, telecommunications, to which I had no exposure yet. As you can see in the overview, Singtel was certainly no home run, but could be worse as well, decreasing only 2,5%. But my timing for Tencent was terrible. The stock continued to slump and has been one of my biggest bleeders. As a long term investor I have the benefit of time and I still believe that this investment will play out right given enough time. When we take a look at the stocks in the consumer sector, we see that most of them have performed really well, except for the two smaller positions: the Dutch small caps Accell and Amsterdam Commodities. Accell could become a special case stock: the Dutch competitor PON seems to have renewed interest to take over the company (link is in Dutch). But because Accell already dismissed an earlier bid, it is a big question if shareholders can expect a premium. Also some questionable book-keeping was uncovered, which obviously did no good to the share price. I will keep a close eye on Accell: although I do not trade, I am willing to sell a stock if my reason for purchasing it would become invalid. The industrial sector has not been performing very well, especially the German giant BASF is down a lot. Union Pacific and Vestas are exceptions to the rule in this sector, the latter recently reported a good outlook on its operations after which the stock took off. My healthcare stocks have gone up on average, though I have still lost money on Novo Nordisk and Gilead. Utilities are up, which is not unexpected during a market correction, the same can be said for REITs. Technology is a mixed bag, with ADP performing magnificently and Tencent going down even further. Infosys performed a 2:1 share split. This means that my total number of shares of this Indian company doubled from 67 to 134. This does not change a thing about the stock, except that it creates a lot of administrative hassle in my opinion. It is a complete mystery to me why they approved this stock split, since the decrease in stock price of $20 to $10 is not likely to improve liquidity. The price of a single share was already quite low. It might be a part of Indian business which I do not understand. ADP announced its second dividend increase of this year! The quarterly dividend will be increased by 14.5% to $0.79 per share. This increase takes the stock yield a bit over 2%. Not very high, but this is also due to the share price increase of the last couple of months. First of all, if the overall result of 2018 would remain at its current 6.21%, I would be very happy! Though the portfolio will only blow out its first birthday candle during next January, it is still motivating that a chosen strategy seems to play out in a volatile investment year like this one. Still, I am fully aware that a year says nothing. Investing for your retirement is keeping your eye on the long term and sticking to your strategy. 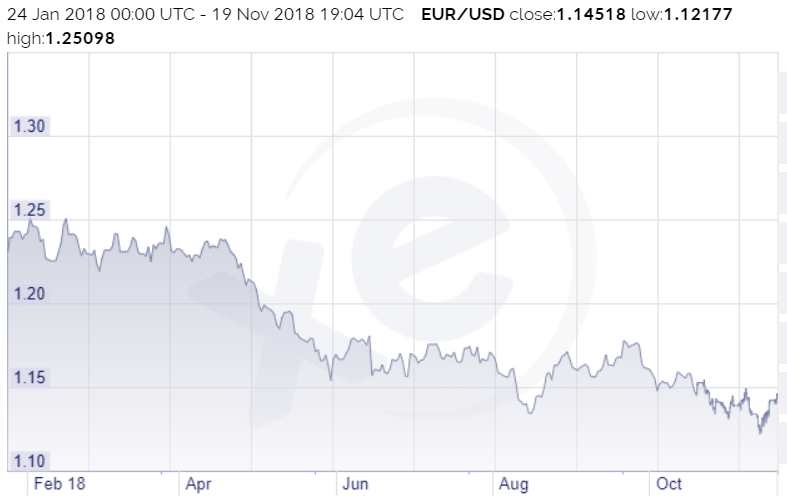 Also, the bulk of my positive results this year are explained by the EUR/USD exchange rates, if I would be living in the US my results would be negative. So the results of this year are just waves in the ocean, but sticking to the strategy is the ocean. At the end of this year I will write a yearly wrap-up for 2018, and I will also start looking for investment targets to add to my portfolio in January 2019. My strategy is to invest an additional sum of $3,000 in this portfolio every half year. Thank you for reading! If you have any ideas about my model portfolio, please let me know in the comment section below! If you liked this article and would like to read more of my work in the future, please click the Follow button next to my name. Disclosure: I am/we are long ALL STOCKS MENTIONED. I wrote this article myself, and it expresses my own opinions. I am not receiving compensation for it (other than from Seeking Alpha). I have no business relationship with any company whose stock is mentioned in this article.